Sierra Leone ( /siˌɛrə liˈoʊn(i)/, UK also /siˌɛərə ʔ/), officially the Republic of Sierra Leone, informally Salone, is a country on the southwest coast of West Africa. It has a tropical climate, with a diverse environment ranging from savanna to rainforests. The country has a total area of 71,740 km2 (27,699 sq mi) and a population of 7,075,641 as of the 2015 census. Sierra Leone is a constitutional republic with a directly elected president and a unicameral legislature. Sierra Leone has a dominant unitary central government. The president is the head of state and the head of government. The country's capital and largest city is Freetown. Sierra Leone is made up of five administrative regions: the Northern Province, North West Province, Eastern Province, Southern Province and the Western Area. These regions are subdivided into sixteen districts. ^ a b Official projection (medium variant) for the year 2013 based on the population and housing census held in Sierra Leone on 4 December 2004 Script error. statistics.sl. page 13. ^ a b c d "Sierra Leone". International Monetary Fund. https://www.imf.org/external/pubs/ft/weo/2018/01/weodata/weorept.aspx?pr.x=48&pr.y=6&sy=2018&ey=2021&scsm=1&ssd=1&sort=country&ds=.&br=1&c=724&s=NGDPD%2CNGDPDPC%2CPPPGDP%2CPPPPC&grp=0&a=. ^ "Gini Index". World Bank. http://data.worldbank.org/indicator/SI.POV.GINI/. ^ "2016 Human Development Report". United Nations Development Programme. 2016. http://hdr.undp.org/sites/default/files/2016_human_development_report.pdf. ^ Encarta Encyclopedia. "Sierra Leone (country)". Sierra Leone (country). http://encarta.msn.com/encyclopedia_761563681/Sierra_Leone.html. Retrieved 19 February 2008. ^ "National Electoral Commission – Press Release". 6 September 2017. http://necsl.org/index_files/2017_Press_Releases/Completed_RegistrationPressRelease2017.pdf. ^ "Sierra Leone unveils new geographical map". 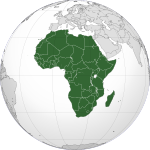 Africa Review. http://www.africareview.com/news/Sierra-Leone-unveils-new-geographical-map/979180-4041036-4x8dfaz/index.html. ^ "The World Factbook". https://www.cia.gov/library/publications/the-world-factbook/geos/sl.html. ^ "All things happily to all men". The Economist. 31 May 2014. https://www.economist.com/news/middle-east-and-africa/21603015-sierra-leone-bucks-west-african-trend-celebrating-its-religious-tolerance-all. ^ Batty, Fodei J. (2010). What Role for Ethnicity? Political Behavior and Mobilization in Post-Conflict Sierra Leone and Liberia (Ph.D.). Western Michigan University. http://scholarworks.wmich.edu/cgi/viewcontent.cgi?article=1503&context=dissertations. ^ "Sierra Leone Population below poverty line (%)". Indexmundi.com. 30 June 2015. https://www.indexmundi.com/g/g.aspx?c=sl&v=69.